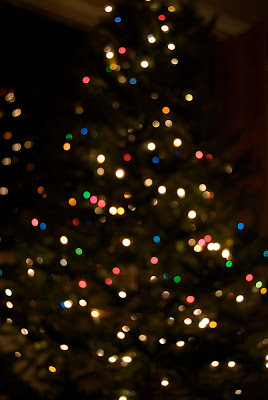 As I wrote in my last blog, we are putting the tree up in front of the picture window this year. We have never had it there before for many reasons, mostly, for the past 10 years both Dad and Mollie got daily pleasure from the view of the window and it just wasn't never considered to cover that up. Monday night we decorated the tree, and as always it is so fun to look at all the decorations and select our favorites to put up, and leave the rest in the box for the next year. This is Scott's second year with us, and it was fun to have him help decorate. He noticed decorations that we don't notice anymore. If you know what I mean. 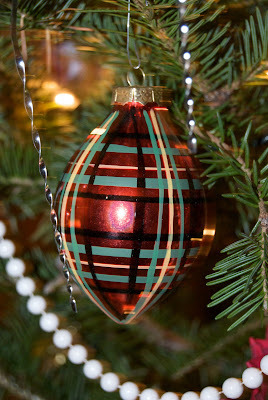 We have so many decorations on the tree for sentimental reasons, not for beauty, and it was fun sharing stories about where they came from and why we love them. 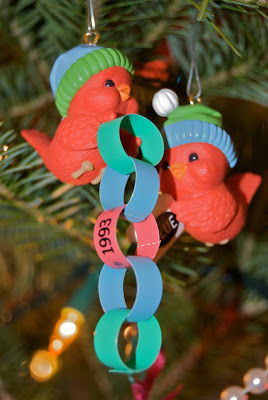 We have all loved these tiny little birds doing a paper chain and as you can see, its pretty old. Michelle and Stephanie always felt it was them working together to make the chain. I can't remember who is who of the two little birds but they loved to look at them. 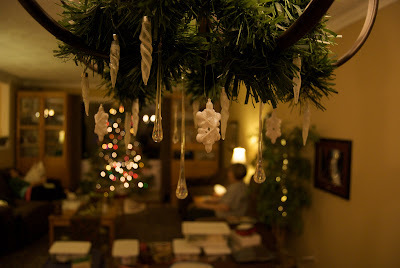 I love the icicles and snowflakes that adorn our dining room chandelier. As most of you know, Stephanie and Sean are in Korea for Xmas and they will celebrate Christmas day very differently than we will. While we will do all the same things we do every year at Christmas, it won't really be the same at all. Our first Christmas without Michelle two years ago, was hard, but she was spending Xmas with Scott's family. I knew she was having fun, sharing Christmas with another family, and experiencing their Christmas morning traditions. This year, I will think about Stephanie and Sean spending Christmas in a country who doesn't generally celebrate this holiday. While their subways and malls have Christmas Trees decorated, there is no midnight mass and no turkey dinner. They will spend a very different Christmas, and its their first Xmas together, too, so they will start building their traditions together. 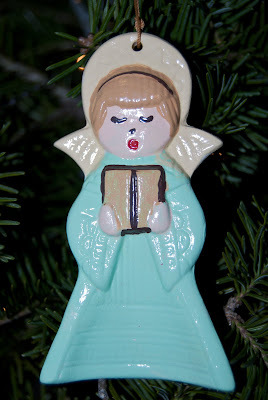 Stephanie was in our thoughts and stories as we pulled funny decorations out of the boxes... her green angel she made in Kingston Ontario in 1987 when she was three. It was my first "gift" from Stephanie. She made it with the help of her babysitter. 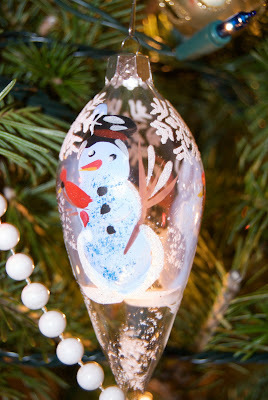 Every Christmas is different, and that's the fun of it. This year, we have two dogs here and neither dog was here last year for Xmas. 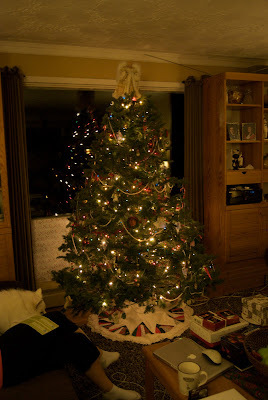 Of the 5 cats who are here for Xmas this year (with their own tree downstairs) only one spent Xmas with us last year. Who knows what next Christmas will bring! 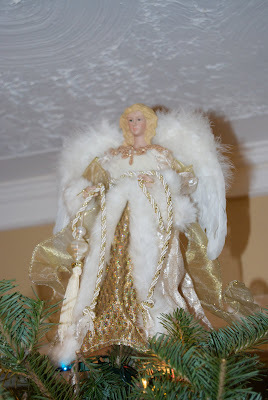 our Angel who sits regally on the top of the tree looking over all of us and and reminding us that this day is Jesus's birthday and that's really why we celebrate this holiday. That's what I think when I see her, anyway. Your tree looks beautiful in its new location. I will have to do a drive by to check it out at night with the lights on. Ahh, nice. I recognize that treeskirt. I have one the same. Did you make it for me way back when or did I make it for you? I just gave it to Patience for her very first tree and I just made myself another one this week. 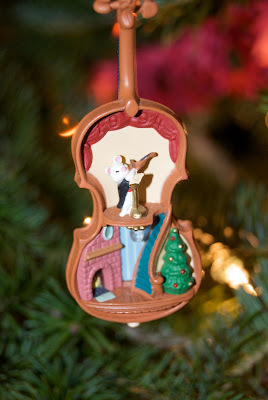 I love all your old ornaments. Very sweet how they have such nice stories and memories.